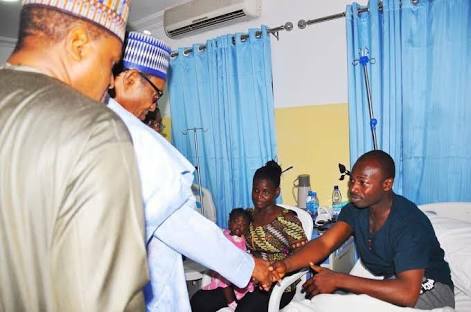 President Muhammadu Buhari on Sunday evening paid a get-well-quick visit to the two Nigerian Air Force pilots who survived a crash last week, at the Defence Intelligence Agency hospital in Abuja. The president gave glory to God for sparing their lives. He also commiserated with them on the loss of their colleague, Sqn. Ldr. Bello Baba-Ari. Chief of Medical Services at the hospital, AVM Saleh Shinkafi, assured Buhari that the medical condition of the officers was improving steadily. He added that they were being kept for further rest and counseling, as part of the rehabilitation process. The Chief of Air Staff, Air Marshal Sadique Abubakar, who was also on hand to receive the President, explained that the three pilots ejected successfully from their jets after the collision. He, however, added that the helmet of Baba-Ari flew open, which led to a head injuries that turned fatal.